Cuba was booming last night @ 6.165MHz and 26.165MHz. with LPF only. Should be nothing heard @26MHz. 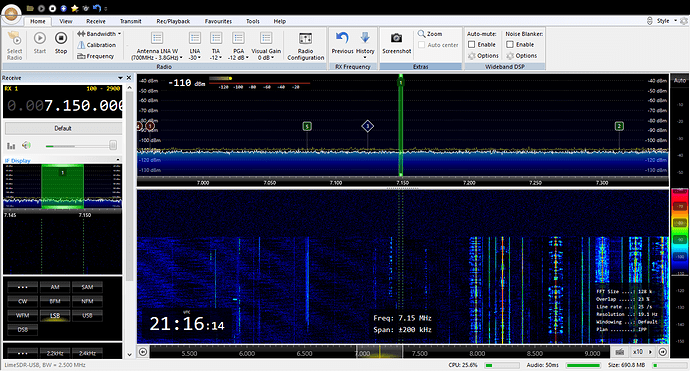 Even with LPF (0-30MHz) and BPF (14MHz) in line few artifacts at 5MHz bandwidth, 4-5/band on 20M, not a big deal, but may need some work @ LimeSDR side to remove them. 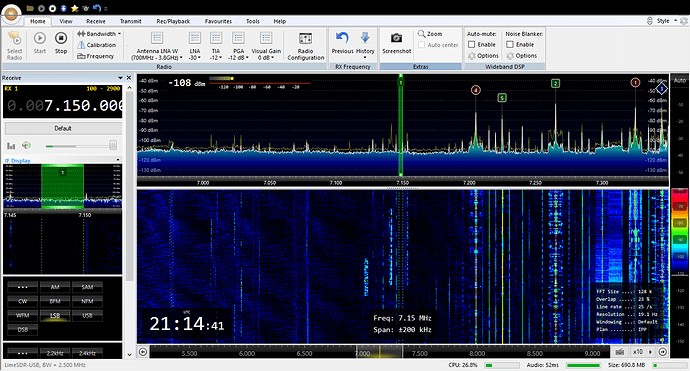 Same observed using HDSDR. Try a band pass filter system. With low pass you still get all the harmonics from big AM medium and short wave stations, your refrigerator, the neighbours hot rod, the kids motorcycle behind the house etc etc ad nauseum. Also unless you are running that in a shielded enclosure (really shielded, not just a metal box though that is better than nothing) and have a very quiet or linear power supply you will have all kinds of spikes no matter what. 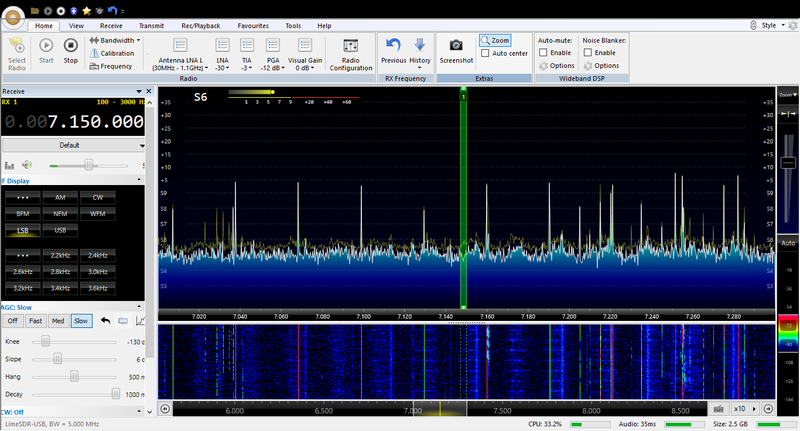 Also all my SDR’s get spikes from the USB, even my HPSDR until I moved it to an ethernet interface. Shield it, feed it clean power and get some ferrite beads on the USB cable and you’ll likely see a massive improvement with a lot of those spikes disappearing into the noise floor. Shielded, ferrite beads on USB cable. Products displayed are from internal n-order of harmonics. .
2 filters inline, LPF and BPF. I do have an extra SDR receiver to compare outside noise from antenna. When LNA-L is disconnected display is flat. Are you using this specific model (LimeSDR with EasyFix2 mode) and have/do not have same issues? Excellent! You already know to deal with the basics. So are you saying with the LNA off it’s a flat spectrum but with it on you get the spurs? My LimeSDR hasn’t arrived yet but I’ve been using SDR since 2011 in one form or another. 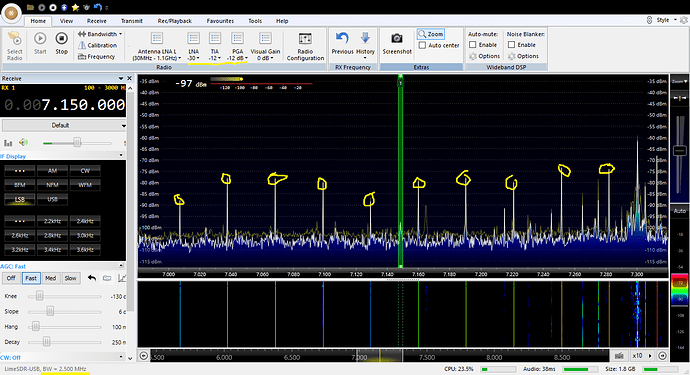 Spikes are on as soon as antenna connected even if no signals on the band. No need to increase gain of LNA, so “spikes” present at very high levels everywhere, where they are not supposed to be. I can leave with some, 3-4 freq’s/band not a “killer”, but prefer to look at clean spectrum. May be mixer levels are not ideal/need adjustment and internal filtering is not engaged. That’s probably not internal to the SDR then, so it’s a bug hunt. What are you using for power? It is 100% internal . When you receive yours, add LPF 0-30MHz and BPF for 40m, quick test go to 41M and identical stations will be 5/10/15 and 20MHz up at almost same levels, may be 6dB down. Images. I/Q balance/ LO voltage probably to blame.May be sampling rate. If it was internal you’d have spikes without any antenna connected. assuming that ground from Lime side can be enough…with Al box closed. Soon, some strange spikes proves that assumption wrong. test all is much better. FC-700 used like band pass, RF splitter and LW with 9:1 transformer. Your noise floor is way down and no internal signal spikes on your waterfall. A lot of the other stuff that remained after you did all your work was as you can see around the big signals, where their signals overlap, that is just what a birdie looks like. Awesome, can’t wait till mine arrives. Waiting another… all in hope to spot some LW NDB beacons on LimeSDR too. This is a picture I want to see. 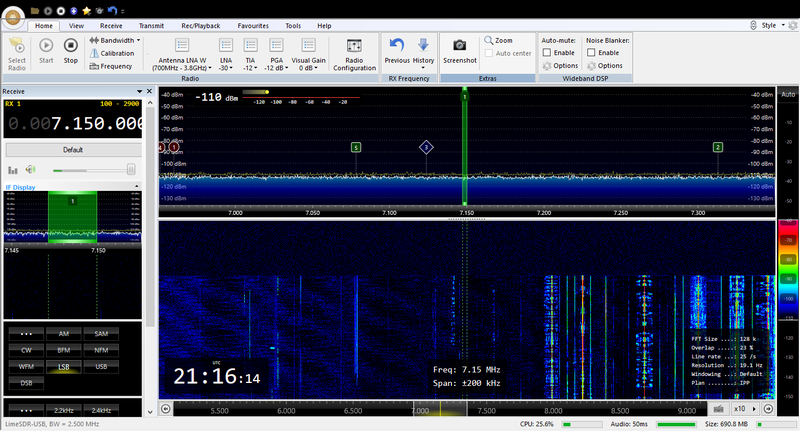 Quickly validated with another SDR RX, it is outside interference. Man-made noise. One more check, could you please add 20MHz to your freq. settings (no other changes) and share screen, is it flat or still has “artifacts” from broadcast stations? 7,150 + 20 = 27,150 you mean? Does adding 10d attenuation show a 10dB drop on the scaled display? I do see spurs from AM stations, but barely on your display, abt 30dB down, possibly antenna tuner works as a better filter.